Interstate 385 is a 42-mile freeway spurring northwest from Interstate 26 to the city of Greenville in the Upstate of South Carolina. The freeway serves as a commuter route for the south Greenville County suburbs including Mauldin, Simpsonville and Fountain Inn, while joining the Greenville metropolitan area with Columbia via I-26. 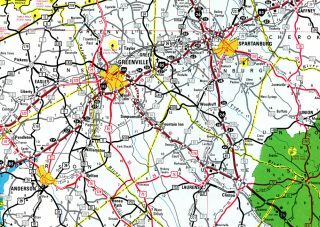 The route carries six or more lanes through the suburbs and city of Greenville, while southern reaches through Laurens County remain a rural four lane freeway. An unsigned Business Spur for Interstate 385 extends 0.49 miles west from U.S. 276 (Laurens Road) along East North Street to link the freeway with Downtown Greenville and U.S. 29 (Church Street). Construction of the Southern Connector extended Interstate 185 southeast to end at Interstate 385 and U.S. 276 in Mauldin. The toll road opened on February 27, 2001. Resurfacing of the southernmost 15 miles was undertaken between January and July 2010. One direction of the freeway was closed for a period of time so that crews could rebuild the roadway with new concrete. Interstate 385 designated as the F.E. Armstrong Highway, after a former South Carolina Highway District Engineer. 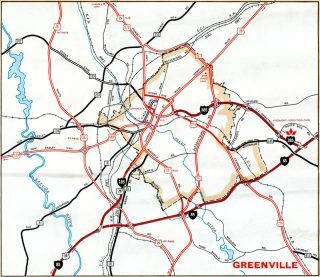 Interstates 185 and 385 provided gateway routes into Downtown Greenville from Interstate 85 until 1984 and 2001, when they were extended south respectively. 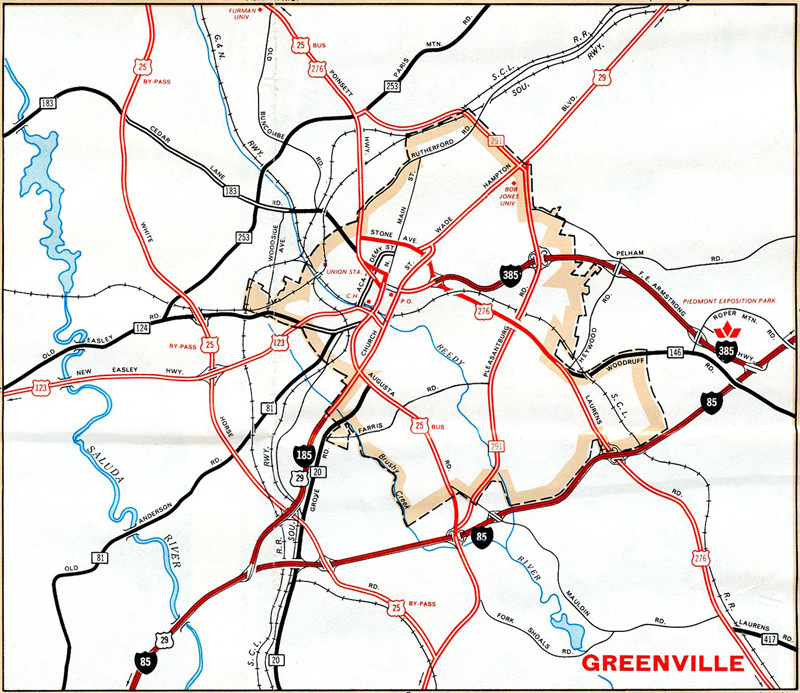 Prior to the completion of the U.S. 276 freeway from I-26 near Clinton to Mauldin, U.S. 276 ran along what is now South Carolina 14 from Laurens north through Gray Court, Fountain Inn and Simpsonville. Interstate 385 turns west through a valley by the Arcadia Hills neighborhood to meet U.S. 276 (Stone Avenue) at a diamond interchange (Exit 42). Photo taken 12/31/13. The freeway passes over U.S. 276 (Stone Avenue) with six overall lanes. This interchange was reconstructed as part of the I-385 widening in Greenville completed by fall 2004. Photo taken 12/31/13. Speed limits reduce to 35 miles per hour as I-385 transitions to North Street, an urban boulevard extending west to the Bon Secours Wellness Arena and Downtown. The street doubles as unsigned Business Spur I-385 west to U.S. 29 (Church Street). Photo taken 12/31/13. A formal end freeway regulatory sign stands just ahead of the intersection with McGee Street north and Boyce Avenue south. North Street proceeds west two blocks to the eastern terminus intersection of U.S. 123 (Academy Street). Photo taken 12/31/13. The Downtown Greenville skyline appeared as Interstate 385 approached Exit 42 with just four lanes. Photo taken 08/23/03. A historical look at the diamond interchange (Exit 42) with U.S. 276 (Stone Avenue / Laurens Road) on Interstate 385 north. This interchange was revised when I-385 was expanded to six lanes. Photo taken by Chris Patriarca (04/06/03). North Street (unsigned Business Spur I-385) east transitions into Interstate 385 beyond the intersection with Boyce Avenue south and McGee Street north. Exit 42 quickly follows for U.S. 276 as it transitions from East Stone Avenue to Laurens Road while leading south to Arcadia Hills in Greenville. Photo taken 08/07/13. This set of original button copy signs saw replacement during the Winter of 2003 during the associated rebuilding of Interstate 385 in Greenville. Photo taken 12/08/99. Passing over U.S. 276 (Laurens Road) during freeway reconstruction, Interstate 385 winds eastward through a valley below the Arcadia Hills neighborhood of Greenville. Photo taken by Chris Patriarca (04/06/03). Business Loop I-385 was shielded at the U.S. 276 (Laurens Road) on-ramp to East North Street until Interstate 385 was reconstructed. Signs now simply reference the northbound on-ramp as simply to Downtown. Photo taken by Carter Buchanan (06/00). U.S. 276 westbound at the former southbound on-ramp to Interstate 385. This ramp was relocated to leave Laurens Road opposite the southbound off-ramp during 2001-04 road work. Photo taken 08/23/03. South from Fountain Inn, Interstate 385 travels as a rural freeway to the merge with Interstate 85 outside the city of Clinton. A button copy end sign, replaced by 2009, was posted 1.5 miles ahead of the wye interchange at I-85. Photo taken by Chris Patriarca (04/06/03). Traffic from I-385 south adds an auxiliary lane to Interstate 26 east for nearby Exit 52 with South Carolina 56. Columbia lies 59 miles to the southeast. These signs were replaced by 2014. Photo taken by Chris Patriarca (04/06/03). A diagrammatic sign posted at the South Carolina 56 overpass outlines the forthcoming split of Interstate 385 north (Exit 51) from Interstate 26 west. Two lanes are allocated for each route. Photo taken 12/31/13. Interstate 385 departs from the left side with two lanes toward Laurens and Greenville while Interstate 26 turns more northward to Spartanburg. Photo taken 12/31/13. Entering the rural wye interchange with Interstate 385 north on I-26 west. 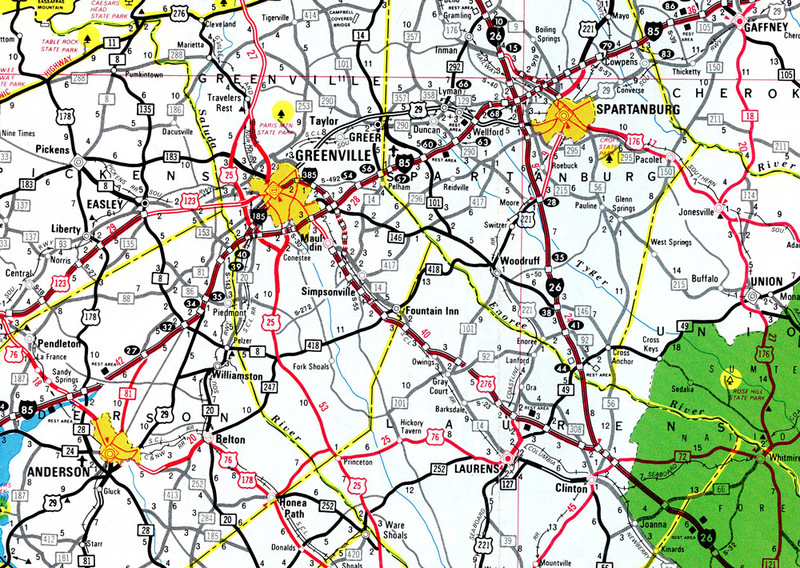 Greenville is 39 miles to the north while Interstate 26 reaches Spartanburg in 30 miles. Photo taken 12/31/13. Former button copy signage posted for the Interstates 26 west and 385 northbound split. Photo taken 10/14/01. The first Interstate 385 interchange lies two miles to the northwest at South Carolina 308. Laurens follows, three miles to the south of Exit 9 along U.S. 221. Photo taken 10/14/01. This set of signs posted at Exit 51 was replaced by 2014. Photo taken by Carter Buchanan (02/01). “S.C. Too Fast With Highway, Hits Dead-End.” Herald-Journal (Spartanburg, SC), Novermber 20, 1959. “New Freeway To Be Built Near Greenville.” Herald-Journal (Spartanburg, SC), January 3, 1978. “Big Industrial Park Planned For Fountain Inn.” Herald-Journal (Spartanburg, SC), August 27, 1986. I-385 Widening Project (Greenville County) http://www.dot.state.sc.us/Projects/I-385/default.html. SCDOT. “Largest road project to ever hit Upstate begins.” WYFF4, January 13, 2016. Page updated January 28, 2016.